Hussard Tenue d’ete in nankin, First Empire. A Hussar dress in white cotton? Pretty cool, eh? Yes, in fact, cool is exactly what this dress is, being a light shell of cotton, and it was used in summer for social occasions to replace the heavy wool uniform. The dress was informally adopted by some hussar and other light cavalry regiments as an alternative social dress. It tended to consist of a dolman and hongroise, worn with a white silk gilet, or the regimental gilet a tresse. Top boots or coloured hessians, sabre rather epee, and a forage cap complete the ensemble. ‘It is in fact a taffeta, whose yellow or buff appearance is owing to the quality of cotton used. This stuff comes from China, particularly in the Nankin region, it is used in the making of pantaloons, gilets and vestes, because of its solidity. This Asian tissue, now introduced into Europe, is made in Italy at Bologna and at Florence. It was made at Lyon since the beginning of the C16th, then at Tours, at Avignion, at Paris, and at Montpellier’. What hussar kit was it used for? Musée de l’Armée in Paris, detail of dolman. 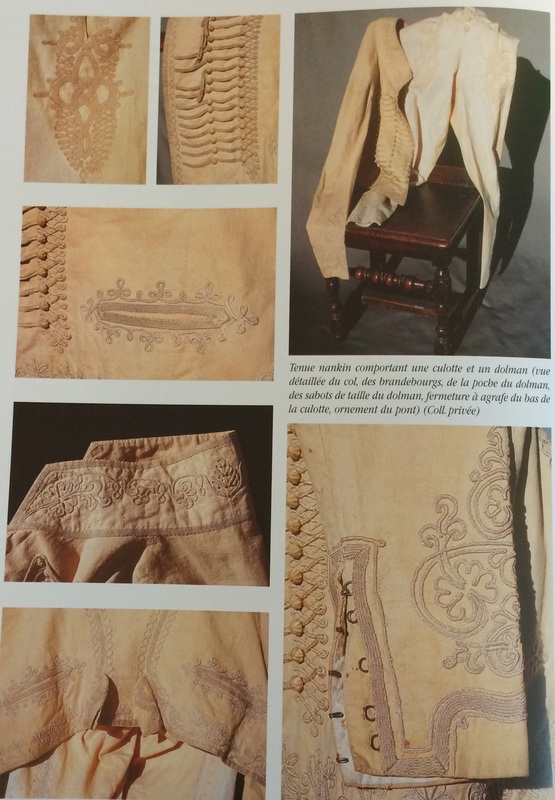 The nankin costume was, for the greater part of its existence, composed of a dolman, a gilet and culottes, decorated with a great quantity of soutache in a matching tone, replacing the usual galons or lace. 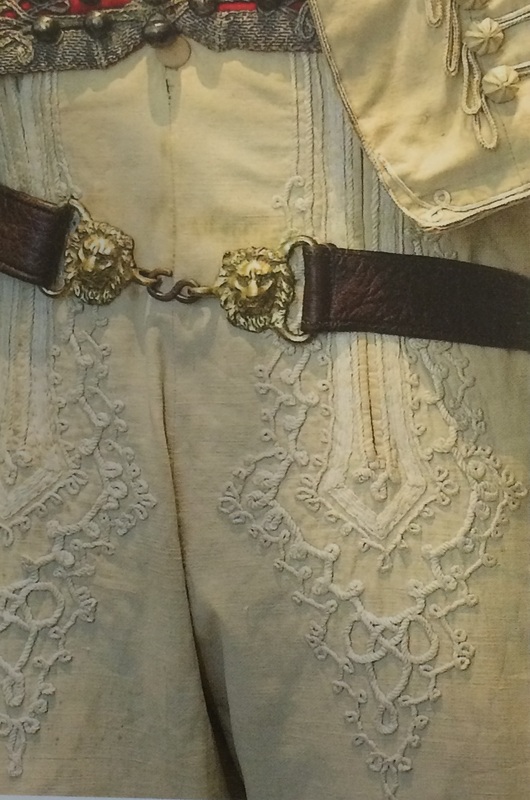 The buttons were of self-covered cloth, of bone, or of mother of pearl, depending on the pocket of the officer. The head dress that completed the tenue was either the bonnet de police or a polish cap, considered the height of chic. Boots, sometimes in red, completed the ensemble. Musée de l’Armée in Paris, detail of hongroise. Musée international des Hussards, dolman and hongroise. 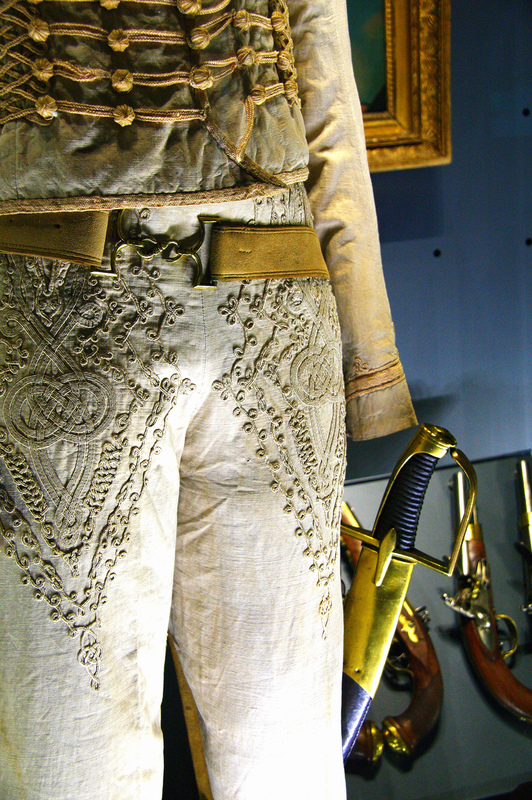 Musée international des Hussards, detail hongroise. 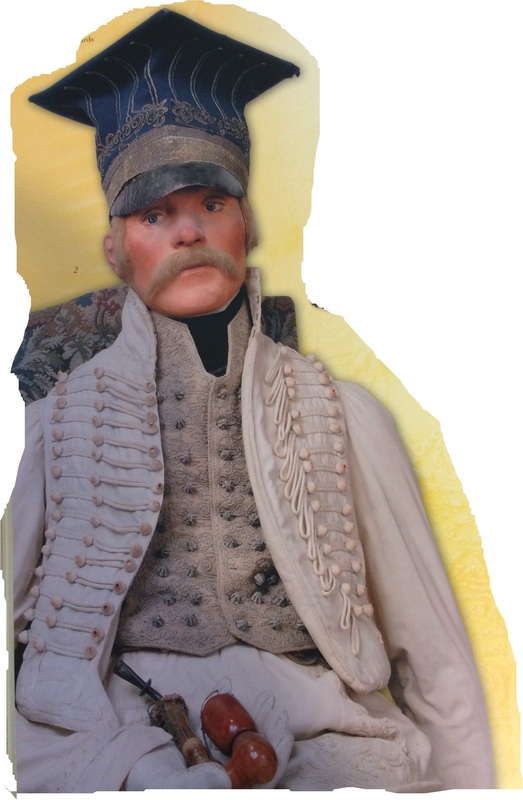 An article published in Sabertache 1893 (p.323) pertaining to the 12th regiment of chasseurs a cheval, relates that permission was given to the chasseurs, corporals and serjeants at all times not on duty or under arms to wear culottes of white or yellow nankin. ‘The captains should hurry the completion of white gilets, nankin culottes and shoes. The intention is at the next review for the officers to appear in white silk gilets, nankin culottes and English boots (riding top boots) and uniform plume. The men to be in white silk gilets, nankin culottes, white stockings and shoes with a regimental uniform buckle’. ‘The review tomorrow leaves at 1030 in petite tenue as normal for the chasseurs and grenadiers (a cheval). The officers in chapeaux, with uniform plumes, nankin pantaloons, English boots and white gilets’. Musée de l’Armée, detail, hongroise. Encyclopedie de les uniformes Napoleoniens. 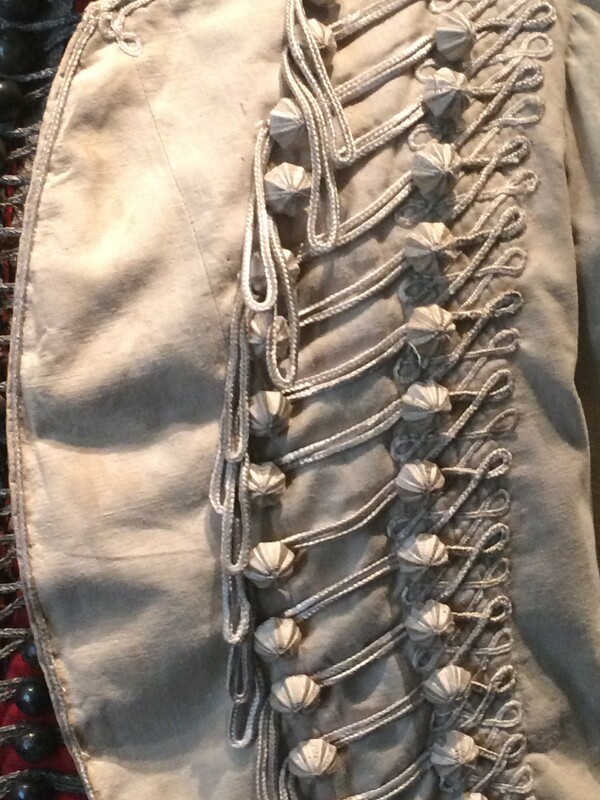 ‘As of today, the chasseurs will no longer wear the pelisse; they will be beaten, cleaned and stored. The dolman will be worn. The chef du brigade recommends to the captains to order the manufacture of nankin pantaloons and white gilets. From today the nankin is permitted. The correct dress for Sunday is nankin pantaloons, white gilet, dolman closed by four buttons, hat and hat plume, sabre and sabretach. 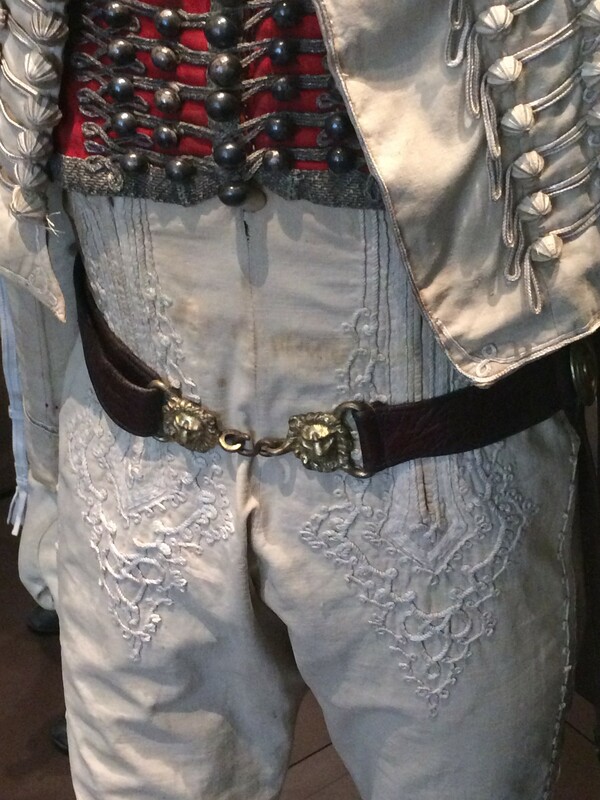 Those without nankin pantaloons will wear green hongroise and the white gilet’. ‘Officers to be in white gilet, nankin culottes, usual boots, black cravat over a white neckcloth and gorget’. Musée de l’Armée, mannequin with added items. 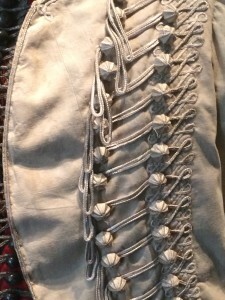 On 21st August, the regiment was at Augsbourg, and the colonel complains that a serjeant-major was walking out on a Sunday in tight nankin pantaloons, stockings and laced shoes; On the 14th September, in a new complaint, the colonel notes that a serjeant arrived for drill in tight nankin pantaloons and is to be punished by the orderly officer. In order to protect French commerce, a decree of the 22nd February 1806 prohibits the importation of white, or printed cotton cloth, mousselines, or cotton thread. A small quantity was permitted under swinging tax, so Nankin was from that point either very expensive, or of French manufacture, with perhaps a different configuration. One can speculate that this expense is reflected in the fact that all the examples of use quoted are of guard or light cavalry units (the conscript chasseurs being not guard in 1809, but attached to guard units as a reserve). These units were prone to expensive or flamboyant display. Nankin dress was, then, not regulated uniform, but specified in regimental orders for certain occasions, and falls under the category of military fashion, rather than uniform. 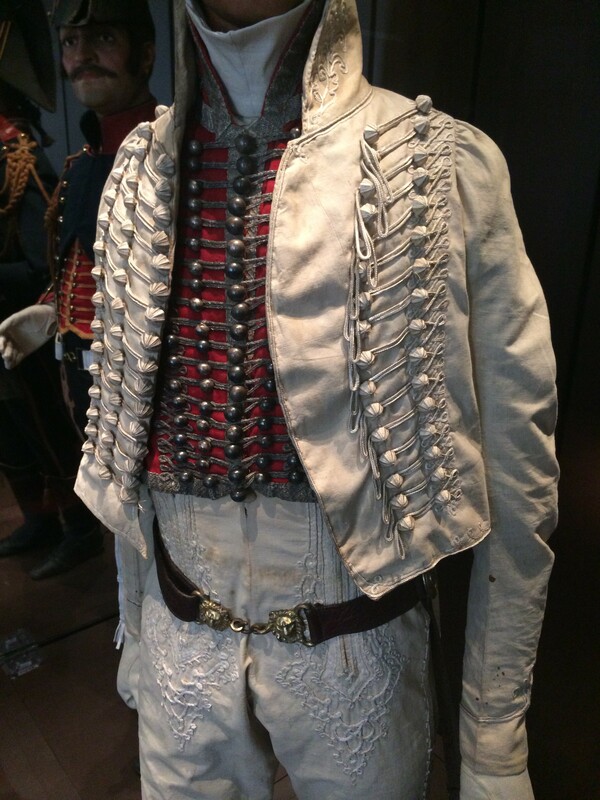 Musée de l’Emperi, hongroise, dolman and gilet. There are examples of this dress in the Musée de l’Armée in Paris, in Le Musée international des Hussards in Tarbes, and in the Musée de l’Emperi in Provence. I have included images of another in private hands from Encyclopedie de les uniformes Napoleoniens. ← A Princess’s favour and revenge.